North Wind Stables is located in Hardwick, New Jersey, in the Delaware Water Gap region of beautiful, rural Warren County. North Wind Stables is a full-service, public, show horse boarding, training and lesson facility, open six days a week (closed on Mondays). 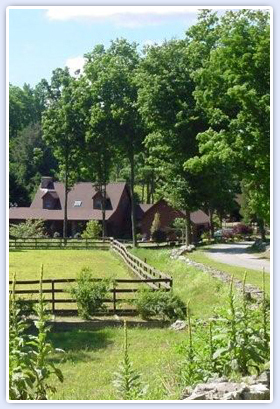 It is also the home of Saddlebred Rescue, Inc. Lessons for beginning through advanced riders in a safe, fun and beautiful environment. You do not need to own a horse as we have a string of quality horses for your use! Can I take lessons if I don’t own a horse that is in training at NWS? Yes, we offer a Lesson Program in which you use our horses. These horses are experienced and can carry riders of varying ages and skill levels. This is an advantage to you. As you improve your skills, you can move up to more advanced horses. NWS is unique in its ability to provide a large and varied selection of lesson mounts; horses which are also able to give you your first show ring experience in the entry-level Academy classes. What styles of riding do you teach? We start all new riders in balance seat horsemanship. As a rider progresses, we make the necessary adjustments in technique to accommodate the goals of that individual rider. You can easily transition to saddle seat, western or hunt seat on-the-flat. Our lessons always promote balance and control of the horse, which are essential for trail riding. Or if riding is not your “thing”, we have many lesson horses that can be used for driving. We do not have a set age limit. We do offer tiny tot lessons and we currently have riders who are well into their seventies! Very young children will be evaluated by the instructor, in conjunction with the child’s parent, to determine if they are ready for lessons. Do I need to provide a helmet for my lessons? For the first few lessons, we have helmets available. If you continue to ride, we recommend you purchase your own helmet and have it fitted properly to you. What type of clothes and shoes do I need to wear when I take riding lessons? First and foremost, we require long pants, regardless of the weather. Shorts are never permitted. We recommend boots, but for the first lesson, a hard-soled shoe with a heel is allowed. We will direct you in finding appropriate boots. 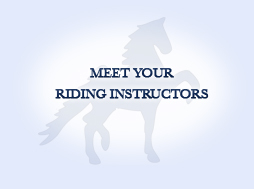 We require all new students to ride in private lessons until we have fully assessed their riding capabilities. Group lessons are available, but on a limited basis. Can we become involved in more than just riding? Yes, our instructors are more than willing to teach you the basics of handling and grooming a horse. Please let your instructor know that you have this interest so that appropriate time may be allotted. Are there showing opportunities available for lesson students? While no one is required to show, we do have a series of Academy tournament shows that are designed for individuals taking lessons on a stable-owned horse. Can I get lessons when you are at a show that I am not attending? Yes, NWS has instructors available that typically do not travel to horse shows. You may schedule a lesson with one of them.